Dave Rennie's Glasgow were able to do what Benetton almost did the week before at the RDS. It remains to be seen what influence, if any, these performances have on the play-offs. "It's picking apart various bits of the game and, win or lose, that is what we would normally do," said coach Leo Cullen. "Sometimes when you win a game, you play terribly. Sometimes when you lose, you don't play that bad. "It's trying to have that sense of perspective all the time," he said. In fairness, Glasgow came hunting the points that would put Munster back in their 'second place' in Conference A and they did it with the best combination they could call on. The motivation for Leinster was different as there were spots up for grabs for Europe. "We will pull that apart as coaches and then start to deliver a plan that is good enough to get a positive performance and result against Toulouse." In fact, the current form wasn't too different last year when Leinster had drawn two and lost two going into that semi-final against the Scarlets. It is something Cullen has grown accustomed to as a three-time captain of European Cup triumphs and a one-time winning coach. The problem is Leinster were able to draw on Ireland's Grand Slam last season and the confirmed confidence was used to propel them forward. This time, Ireland's main men have come away from the Six Nations with bruised confidence and questionable form. In addition, Devin Toner and Robbie Henshaw returned from injury against Glasgow, the former getting through the entire 80 minutes and the latter growing into the game before leaving in the 58th minute. The sight of Tadhg Furlong grimacing in pain as his knee was flexed was a heart in the mouth moment for Cullen and Ireland's Joe Schmidt. Thankfully, the tight-head was able to get to his feet and walk off under his own steam without any discernible limp. There would still have been cause for concern as to how Furlong felt yesterday morning as any compromise of the ligaments could be fatal to his season. 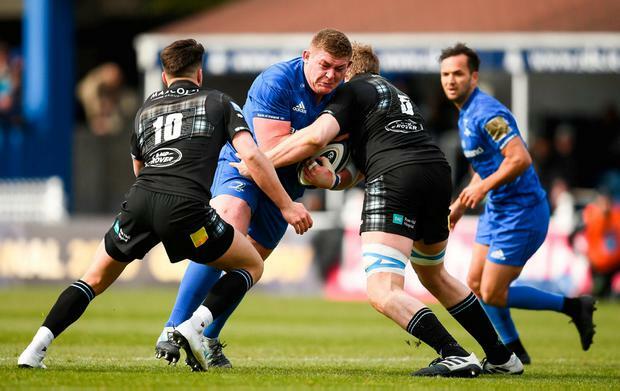 Moreover, the difference in Leinster's physicality when their first-choice props Furlong and Cian Healy were introduced at half-time on Saturday was immediate and instructive. The time to deliver is here and Leinster can draw on muscle memory. "We are a long way into the season, so the players have played and have experienced some very big days together. "The experience is there that they can call upon," stated Cullen. "It's just about putting a nice cohesive week together now and making sure we are all good to go."